Although the high speed Thunderbolt protocol was introduced with Apple's MacBook Pro line in March 2011, products have been slow to reach consumers, but Matrox looks to change that with its DS1 docking station. Launched last week, the $249 Matrox DS1 is one of the first Thunderbolt docking stations to hit the market, providing a breakout box into which Mac users can connect their collection of peripherals with one cable. Most Thunderbolt-equipped accessories seen so far have been high-end hard drives or external SSDs, monitors and specialty equipment targeted at professionals. While this trend is normal with many new I/O formats, Thunderbolt has taken an unusually long time to curry favor with device makers marketing to the average consumer. Currently, MacBook Pro or Air owners have few choices when it comes to a Thunderbolt-ready hub, one being Apple's own Thunderbolt Display, which is disappointing given the spec's bandwidth capabilities. 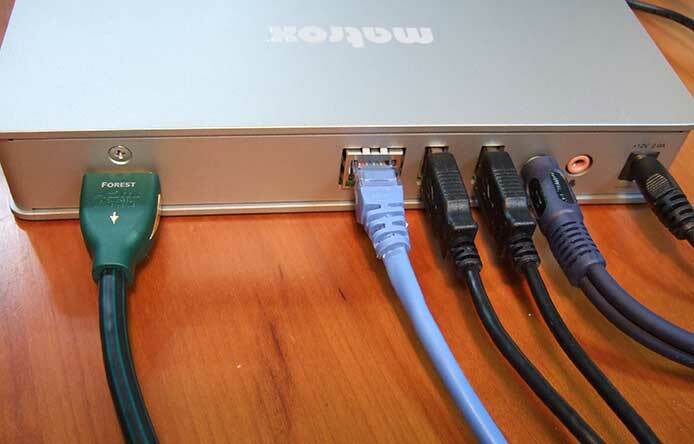 As for the Matrox DS1, the concept is simple: create a dock that leverages the 10-gigabit per second protocol to consolidate a number of components on a Mac user's desk. Matrox DS1 front view when connected to laptop and "SuperSpeed" USB 3.0. Build quality is high, with an aluminum frame protecting substantial, weighty innards. On the back are two USB 2.0 ports, separate audio in/out plugs, a Gigabit Ethernet port and either an HDMI or DVI output connector, while the front stays clean with one "SuperSpeed" USB 3.0 port and one Thunderbolt port. The unit is not very large and sits rather unassumingly at the end of a Thunderbolt daisy chain. Note that the DS1 must be at the end of a chain because it does not support Thunderbolt pass-through, something painfully obvious as the station only holds one Thunderbolt port. While not a problem for most consumers, pass-through is a main feature of the high-speed I/O tech and mimics the abilities of FireWire. In the case of Thunderbolt, the specifications limit the chain to seven devices, including two Thunderbolt-enabled displays, at least one of which requires two ports. On the topic of FireWire, the DS1 curiously lacks support the legacy high-speed standard, a choice which could be a deal breaker for some. Many pro users, especially those in the audio/visual industry, still have equipment that outputs through FireWire. Matrox says that market studies indicate that most MacBook Pro and Air users don't own FireWire equipment, so the company opted for USB 3.0 instead. Backside ports. From left: HDMI, Gigabit Ethernet, two USB 2.0, audio out, mic in, power. Over the week AppleInsider was able to test the DS1, it performed as expected, with high transfer rates over USB 3.0 and low-latency display output through HDMI. There was zero lag when mirroring a late 2011 15-inch MacBook Pro's desktop, including full-screen video, on a 55-inch HDTV in full 1,920-by-1,080 resolution. It should be noted that customers must decide between either a DVI or HDMI configuration as the docking station does not support both. Transfer speeds over USB 2.0 and Gigabit Ethernet were on par with the direct output from the laptop's ports, and the so-called SuperSpeed USB 3.0 was a welcome addition to the year-old laptop which lacks the newer interconnect. The station also delivers power over USB as the current iterations of Thunderbolt still rely on copper wire, though this will change once interconnects switch to fiber optic sometime down the road. For owners of current Retina display MacBook Pros, the station basically replicates the existing I/O ports, the only addition being Gigabit Ethernet and one USB connection. The choice to stick with two USB 2.0 ports in the rear of the DS1 is also questionable as it seems like a step backward from Apple's all-USB 3.0 offerings. Plug-and-play operability was solid, and devices were recognized quickly and without fault. Thunderbolt peripherals, like LaCie's external SSD, saw negligible drops in speed, and USB 2.0 HDDs worked normally. 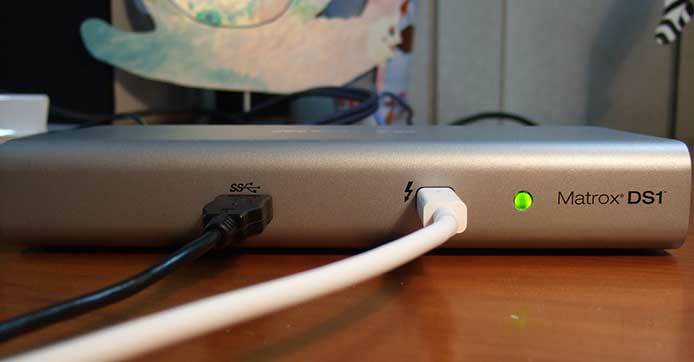 When all ports were connected to and operating a peripheral, the DS1 got a bit warm, as did the Apple Thunderbolt cable feeding out from the laptop, but temperatures never reached a critical level. 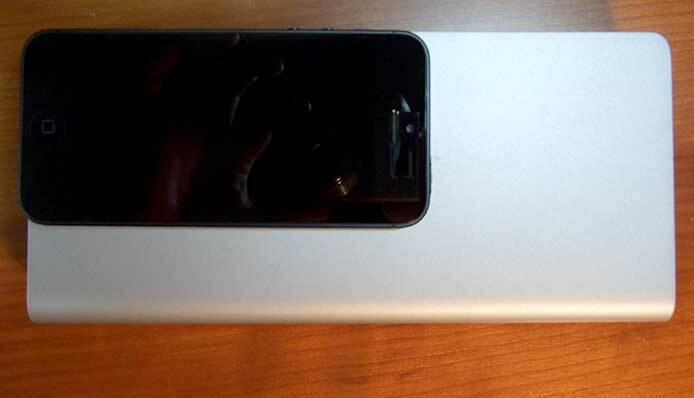 Size comparison with iPhone 5. It is clear Matrox is targeting the mass market with the DS1, with more standard USB and HDMI ports and a desktop-friendly design, but the accessibility comes at a steep price. With Apple leading the charge in Thunderbolt adoption, however, docking stations like the Matrox offering could begin to hit store shelves at increasingly lower prices. The unit is on sale now at select retailers and the online Matrox store for $249.